Believe it or not, we are still a good eight months or so away from the iPhone 7 being announced, assuming Apple sticks to the tried and tested release schedule that it has been adhering to for some time now. We have no reason to think that this year will be any different, so yeah, eight months. With that timescale in mind, we’re a little surprised by just how much iPhone 7 news is already appearing, whether that be supposed parts leaks – we’ve seen the iPhone 7’s display parts, if you believe the leaks – or simply fan-made concept art. It’s that latter category we are most interested in today, though, with a new iPhone 7 concept from iPhone-Tricks YouTube channel very much catching our attention. The reasons for that are many, though we’re more interested in the software at hand than the hardware. True, the concept does show some pretty impressive edge-to-edge display action going on with the Home button integrated into the screen as per a certain rumor, similar to a previous iPhone 7 concept, but it’s the version of iOS 10 shown in this concept that has us most interested. 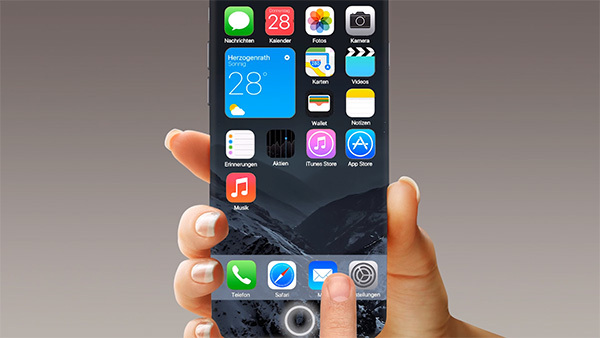 With icons that turn into widgets when touched just so, a Dock that can be resized to allow for more app icons and a swiping gesture for that new Home button that would allow users to go back instead of reaching to the top-left of the ever-expanding screen all the time, this vision for what iOS 10 could offer hits just the right notes for us. Unfortunately, we doubt that Apple will be doing even a fraction of what this concept highlights, but with WWDC 2016 not too far away now – it’s certainly closer than the iPhone 7 – we shouldn’t be waiting all that long before we see iOS 10 in all its glory. Let’s just hope it’s as impressive as Mac OS X was back in the day. Watch the concept in action in the video embedded below. Some of the gestures were cool, but like everyone else said, highly doubt it and very ugly! Someone sure enjoys smoking crack!